Eventually there should be a larger section presenting this crucial period in more detail. At the moment I don't have sufficient material. Magazine comics from that time will remain in the preceding section. 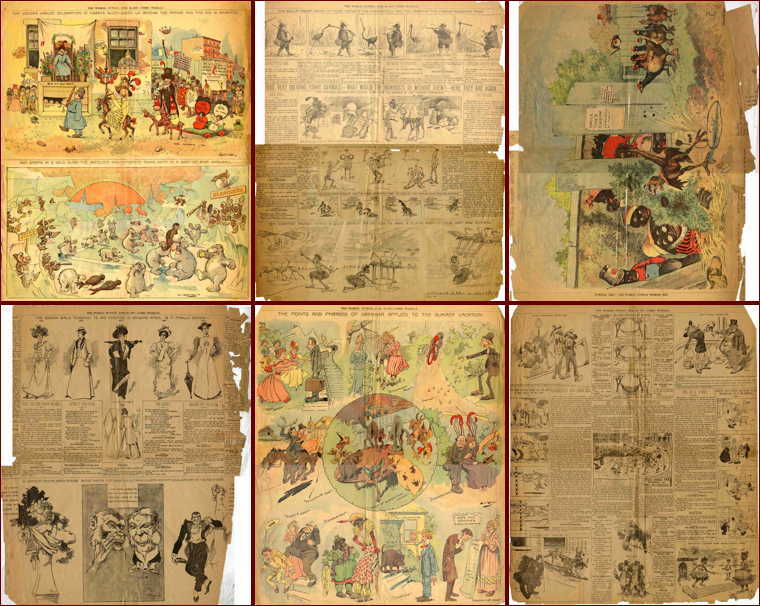 It is difficult to decide how important the development of comics in humorous magazines and in the newspapers respectively were, without studying a lot more of the work. Below you can at least sample the visual flavour of one magazine and that exciting new thing, a comics supplement, both from the summer of 1897. At the time it wasn't clear that it would be the supplements which would develop into modern comics. Magazines like Puck, which were based on German magazines of the time, such as 'Lustige Blätter', were stuck in a bit of a rut. The type of comics they presented had not changed much for 30 years. 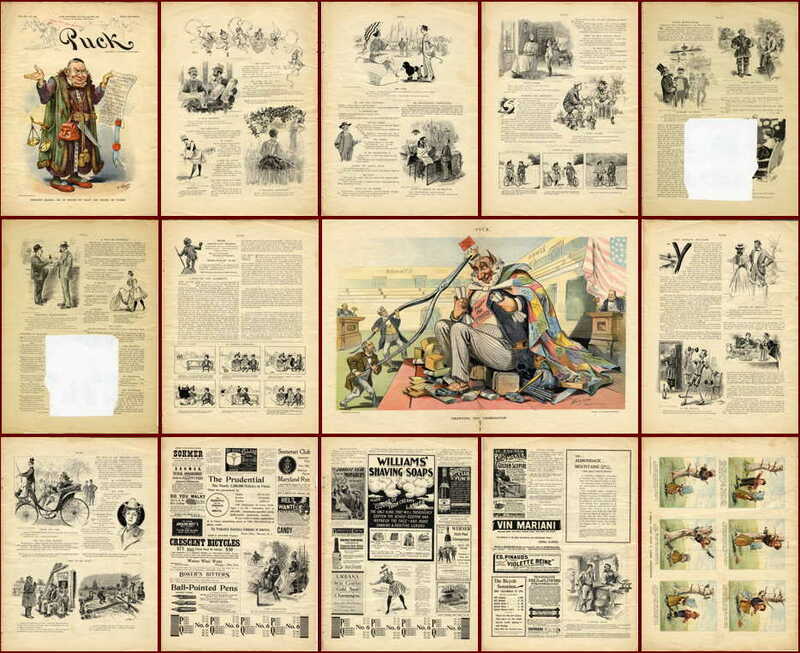 But there were other magazines, such as the German weekly 'Simplizissimus' (starting April 1896), which came up with sublimely inventive designs, and satirical adult themes. Looking at this Puck and the Sunday Comics Supplement , it struck me that both the format and the audience for the latter may be the cause of significant changes. The newspaper format was much larger and cheaper, providing a lot more empty space to fill. The audience was less sophisticated, but (possibly because of this) more open to a particular type of experimentation, despite the dumb and lowbrow humour. Admittedly, this is being wise in retrospect. For whatever reason, these American Sunday pages became the breeding ground for something new. Weirder, rougher, slapdashier. Also easier, for children, but not childish. More popular. More ... somethingier. Maybe it was that new type of human being, the urban immigrant, who was most prepared and eager to pay for all this new visual goings on. As you can see in the example below, early supplements didn't actually have many comics, apart from the usual short black and white snippets, similar to those in magazines. The new, enormous areas of colour were at first used for large, sometimes complex cartoons. But sequential cartoons did start to pop up with a vengeance in the form of Hans and Fritz, the Katzenjammer Kids, based on the popular classic 'Max und Moritz' (1864) by Wilhelm Busch. These two remarkable rapscallions appeared onto this stage of coloured spreads a few months later, on the 12th of December 1897. The Busch influence was of course felt througout the 'magazine-comics-period' 1860-1900. But in young Dirks he had finally found a follower of genius, who together with other likeminded artists, and above all an avaricious public, created the new parameters of the medium.